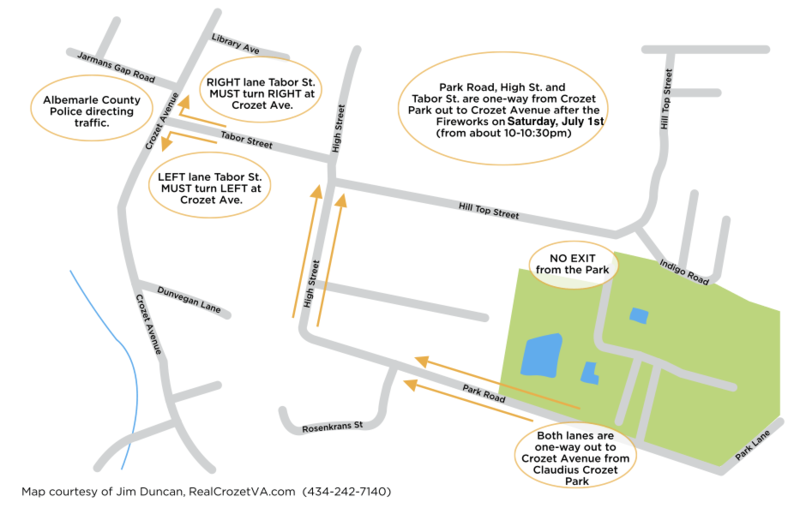 On Saturday, July 1, from about 10 to 10:30 pm (after the fireworks show) BOTH LANES of Park Road, High Street, and Tabor Street will be one?way from Claudius Crozet Park to Crozet Avenue. Albemarle County Police officers will be directing traffic at the Crozet Avenue/Tabor Street intersection. Best Crozet day of the year! Bring chairs and/or blankets down to the route and bags for candy collection. It starts at Crozet Elementary and goes to Crozet Park. If you need to drive down, I can give parking suggestions depending on what side of town you are coming from. People set up at least 15 minutes before the parade starts at 5. There are usually some people handing out freezie pops before the parade starts, I know Crozet Running has in the past. It is fairly crowded from Green House Coffee to Tabor Street, and gets a little crowded again up near the park. We live close enough to walk, so we usually walk home after the parade ends, load up … chairs and blankets and drive to the park. It’s a suggested donation of $4 to get in (kids are free). Everyone sets up chairs and blankets in the grass, there are some kid activities, music, and lots of food trucks, beer, proceeds go to the Park or the Rescue Squad, I forget what charity it is this year. Finally it gets dark, families break out the glow sticks, and at 9:30 the fireworks begin! I think it’s a 20 minute show. After that, the traffic flows one way out of Park Rd and Tabor Street which helps a lot with getting out. We have always had a great time. * And those on/off Park Road, why not email Board of Supervisors asking for sidewalks? It would be nice if Park Road had sidewalks.